I give this to my cat at least once a day and she loves it. 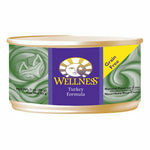 This Purina Friskies canned cat food is well loved by both our cats Sela and Garfield. Every time I open a can they instantly come running to the kitchen and always make it to their cat bowl before I'm even done getting all the cat food out of the can. We have Purina cats. My cat had tried different foods. Some he likes, but more he doesn't. He is finicky and I always come back to this brand. When looking for a wet food for my cats, I chose Purina Friskies Canned Cat Food. Purina has been in the pet food business for over 80 years, they have a strong reputation and my cats love their other Purina food. I love the choices, the flavors and styles available. They have pate, which my cats do not prefer, the pate is a thicker variety. They also have flaked, bits and shredded. These are my cats' favorites. The shreds are real meat with added vitamins and a gravy my cats love! The gravy is the first part they eat, they lick and lick until just the shredded meat is left, then they eat the meat. I like that Purina Friskies Canned Cat Food are fortified with vitamins that are important for my cat's well-being. I add Purina Friskies Canned Cat Food as a treat for my cats, they love it, I love the nutrition and the affordable price. Purina Friskies Canned Cat Food pleases my cat's palate. Purina Friskies Canned Cat Food always remain on top of my cat's list of favorite canned food. I have bought many different brands and flavors of wet cat food. But Purina Friskies Canned Cat Food is always a favorite. They actually enjoy it more than a lot of more expensive brands. I tried to surprise them with a can of more expensive food for each of them for their holiday meal and they turned their noses up to the expensive food and I had to give them their canned Friskies instead. It is always in my pantry for my cats and it's always the food that I start my foster kittens on when it comes time for them to eat solid foods. They tend to take to it very well and become eager eaters. Quality of Ingredients Friskies in general have high quality ingredients. They aren't the highest quality on the market. But it's a good qualityl Flavor Selection Purina Friskies Canned Cat Food has a food array of flavors and textures to choose from. I have 2 cats, aged 9 and 10 and have fed them this food for years. They have grown up to be to healthy, and well cared for animals. They are fed twice a day along with a dry cat food and continue to thrive. They are still mischivious even at their age and I attribute that to their diet which keeps them regular and on schedule. Our cats are huge part of our family and feeding them correctly is hugely important. Quality of Ingredients The ingredients are healthy and good for the cat. We have had them since they were kittens and it is obvious that the quality of the ingredients keeps them healthy. With the many variety of flavors all of the ingredients are equally good. It is a matter of what your cat(s) like and sticking with it. Flavor Selection You can get this cat food in a variety of a flavors. We prefer the turkey and cheese and the price is so reasonable you can stock up. If the store does have a sale, it is hard to know because it so cheap already. Pop a top, and watch them run! 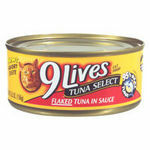 I can't give Purina Friskies Canned cat food anything but a 10. My cats love it. I pop a top and every cat in the house comes running. I have cats from 5 mo old kittens to my dearly, recently laid to rest, 15 year old that have lived their lives on Friskies canned food. For most of Cali's life, she loved the basic Tuna Pate, but as she got older and had to have 12 teeth pulled, I changed her to the more juicy varieties that had gravy in them so she didn't have to chew as much. Towards the end, as she developed liver failure, the gravy varieties were the only thing I could get down her. I feed all my rescues a can of Friskies once a week as a treat and to fulfill that wet meat taste they all crave. I don't give them wet food daily because they do get quite over weight with it and it does affect their teeth as they get older. I buy the 15 oz size cans when I can find them and wish that Purina would go back to making the larger yet sized cans that they made years ago. Not many stores carry the 15 oz can either so sometimes I have to buy the 5 oz instead. I have 30 rescues so that's a lot of cans of food. Would be nice if Purina would consider all it's consumers needs. There are a lot of us out here that do rescues! Flavor Selection Friskies canned food comes in almost any flavor variety you or your cat could ask for. Mine prefer the seafood pate's the best, but seem to crave any flavor I buy for them. This moist cat food has Ms. Kitty begging for it before I can get it out of the can. I do not feed it to her with every meal, but it is something diffrent that I mix with her dry food a couple of times per week. Feeding it any more and kitty seems to have an upset stomach. The price of this cat food is what keeps me going back. It is one of the most affordable on the market, at about 75 cents per can. I hate the price that some of the moist foods cost, when at the end of the day most of it is one in the same. Flavor selection is amazing. your cat will never tire of the exceptional flavors offered. As for Ms. Kitty,Ocean Whitefish is one of her favorites, and she also really chows down on the Classic Seafood. Of course, she likes them all! I trust Purina and the Friskies name to give my cat the nutrition that she needs as well as the flavors that she wants. Flavor Selection The Seafood varieties really score well with my cat but there is a ton of different flavors to choose from. I have 4 cats and only 2 of them enjoy this brand of cat food, over the other Friskies brand. My cats tend to be very picky eaters and will only eat certain brands and flavors of cat foods. I like this brand because it seems to agree with them more than any other brand I have tried over the years. I think maybe the different flavors are enticing to them. I love the brand and I love what it stands for. 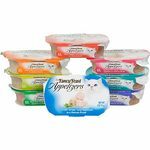 They offer a wide variety of tastes and varieties that also help with any conditions your cats may be experiencing. Quality of Ingredients The quality of ingredients involved in this product is superb. You can actually see what vegetables and meats are used in the processing of this product. All the ingredients in the can are high quality and beneficial to cats. Flavor Selection I am giving this product a solid 10 because of all the flavors this brand carries. They have flavors that will suit any cats taste bud. I purchased this for my senior cats who were overweight because of too much dry food in their diet. I was shocked at their weight loss after eating more wet food versus dry. 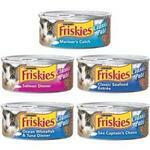 The Friskies canned food had many different varieties and flavors that kept my cats interested. They loved the flavor and would go crazy at the very sight of the cans. Friskies has many different cuts too such as shreds, chunks, and pate. The pate was great for my senior cat who has a broken tooth. It is very soft and he was able to eat it without too much effort. Another good thing about Friskies is that you get way more food for a cheaper price than most canned food. At only about 46 cents a can, this food is a bargain. The can also contains more food than the average canned cat food. Overall I would recommend this to anyone with a sweet feline friend. I would definitely recommend it to someone who overfeed their cat with dry food and needs to help their cat lose weight. It worked for us! Flavor Selection Tons of flavors!